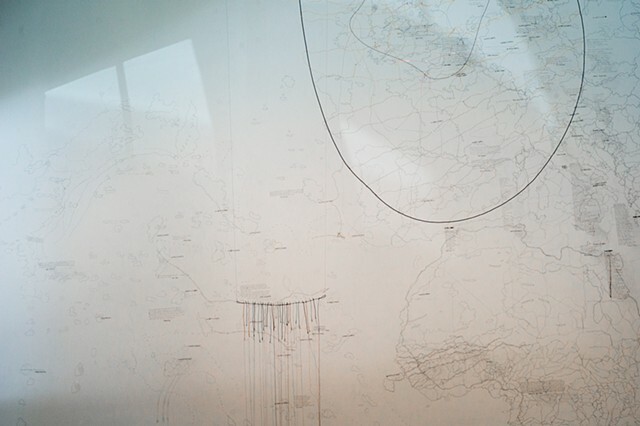 The above data was transformed into a drawing, a loose map, taking over the front gallery of Chandra Cerrito Contemporary. After research, coordinates of the given places along with poems/quotes from the authors were written on the walls. Numbers, letters, lines, and dots created a universe alongside with hanging sculptures which physically manifested the connections between places and people as diverse materials gathered from my trips around the world were used. Seen here: part of the wall drawing with sculptures made of wires, found threads and strings.